For the 15th summer in a row, students from colleges and universities across the country are walking with Crossroads on THREE simultaneous pro-life walks across America. Fr. Dwight Hoeberechts, OMI, is the only priest among them. 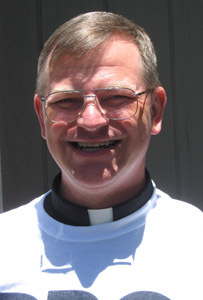 Father Dwight started “the Southern Walk” in Los Angeles on Friday, May 22nd and will complete the walk across America when he arrives at the US Capitol in Washington, DC on August 15th. Crossroads also has a Canadian walk starting in Toronto on July 31st and ending in Ottowa at the Canadian Parliament on August 15th. “Crossroads was started in response to the late John Paul II’s call to the youth of America at the World Youth Day in Denver, Colorado to ‘build a Culture of Life'” said Jim Nolan, president of Crossroads. “He challenged the youth of America and the world to ‘Be not afraid’.